With five days worth of food, 70 ounces of water, and the various accoutrements for nearly a week in the High Sierra’s deep backcountry, our first day and twelve mile journey is nearing its end. As we crest over the pass at 12,000’ we spot tomorrow’s objective: a 14,000’+ peak. The storm clouds are brewing overhead and the thunder booms ominously closer and closer. Despite being very tired, we push on to the next lake only a few hundred feet higher in elevation and maybe three quarters of a mile away. As we arrive at the small snow melt-off-fed lake the storm system has parked itself directly on top of us. Almost instantly the weather goes from a barely perceptible drizzle to a painful torrent of marble-sized hail that is being driven nearly horizontal by the wind. 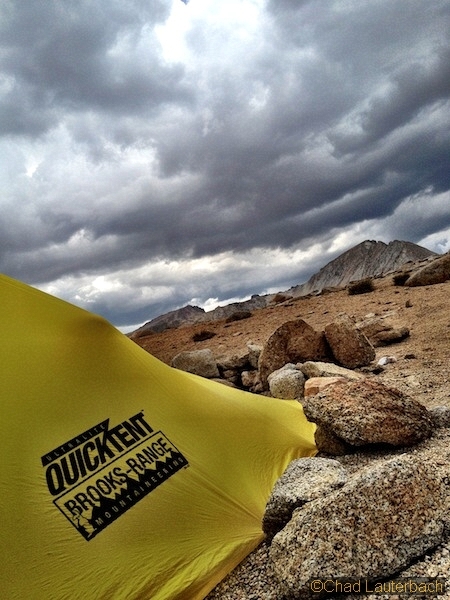 We take shelter behind a large boulder deposited by a glacier long ago and set up camp. Within a few short minutes I have my Brooks Range Ultralight Quick Tent staked down and I duck inside out of the hail and rain, tossing my pack in beside me. As the half-inch deep hail begins to quickly melt into porous gravel I lay down on my ground tarp and listen to the rain and hail pound harmlessly against the walls of my shelter while I snack on trail mix and water and doze in and out of sleep only backpackers know. 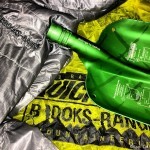 When the Brooks Range tent arrived in the mail I was blown away by how small it was. The tent (which is more of a shelter – more on that in a bit) packs into its own stuff sack which fits into my 1.5 liter Olicamp Titanium pot for easy stowage. There are no zippers, no windows, no vestibules, hanging storage, pockets, or any bells, and whistles for that matter. 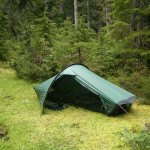 It is a simple ripstop nylon seam-taped tent/shelter designed to be staked down using six stakes and one or two trekking poles. 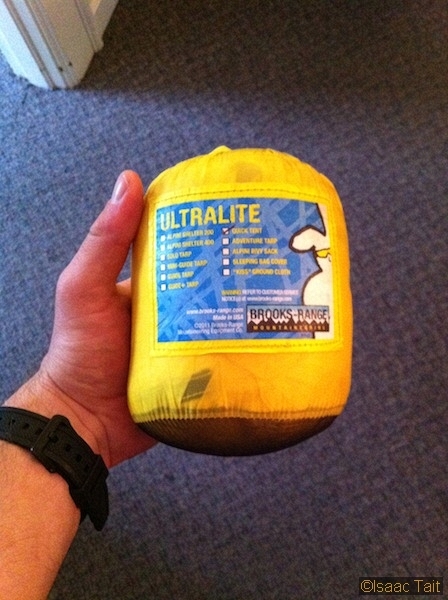 It comes in one color – very bright yellow – yet it is vaguely opaque which lets in and amplifies the light. It’s great for stormy conditions, but not so much if you like to sleep in. 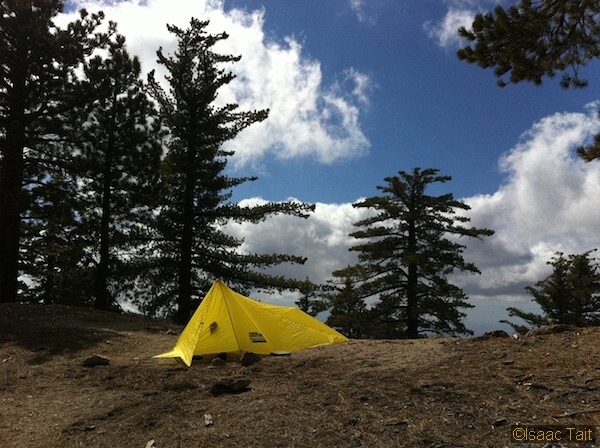 Obviously it is incredibly light, too: the shelter weighs in at a scant 16 ounces. It has no floor, so I added a ground tarp. With stakes, extra cord, and a storage bag the whole kit came to 25 ounces! Not bad at all for a two-person shelter. I could not wait to get out and put this to the test. Brooks Range calls it a Quick Tent, but without a floor, dedicated poles, zippers, and a mesh enclosure I find it hard to call this a tent. I prefer the term shelter. There is room to sit up inside and plenty of room for two people or one person and two packs and then you can still cook inside too. Without a nylon floor you do not have to worry about stoves tipping over or pots spilling as much as with typical tents. Also, if you are truly desperate, you can throw the shelter over yourself for a water and windproof barrier if you find yourself stranded in a location not suitable for pitching your shelter. Considering how light and compact this shelter is, there really is no reason not to carry it on longer day hikes when you may get caught in an unexpected storm, or in your emergency kit for unplanned bivouacs. My first trip out with the shelter was on a chilly May afternoon. A spring storm was clearing in the mountains and I had my sights set on an 8,000’ + peak with a scenic ridge-line traverse thrown in for good measure. Rime ice was forming in the trees and the wind was nipping me through my layers. 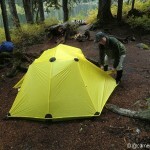 When I stopped for lunch I pitched the Ultralight Quick Tent and ducked inside. Getting out of the wind was like night and day in terms of comfort and when I fired up my small stove and brewed some tea I had to peel off numerous layers due to the stove heating up my shelter to a very pleasant temperature. Since my first time out with the Quick Tent I have slept and sheltered in it in all types of weather conditions, from rain, to hail, to high winds up to 20-25mph (est. ), and in temps down into the low 40s. At first, getting the material nice and snug and keeping the shelter from toppling over upon itself was a bit of a challenge. After a bit of experimentation, however, I finally discovered the easiest and quickest way to set up the tent. First, I stake down the end of the shelter using three stakes – one in each corner and one in the middle. 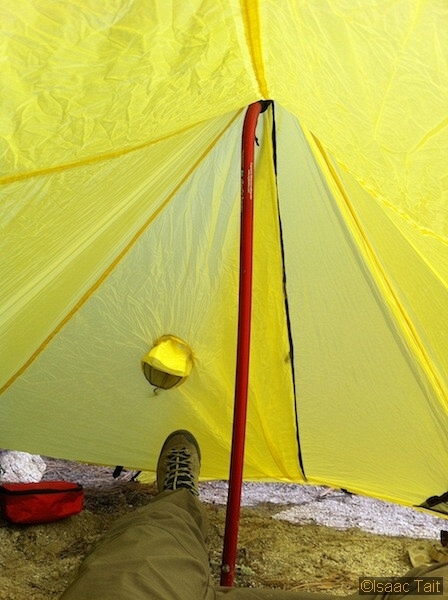 I then set my trekking pole to a height of 45” and place it in the front of the tent. Next, I pull the front two corners forward and mark where I want to stake the corners down. At this point, I have to let go of the shelter and it falls over but I stake one of the front corners, then pull the shelter back up and stake the other front corner. Now the shelter is fully upright – if it is raining you can place your gear inside and crawl in but the tent will flap around quite a bit if there is any wind, so I typically stake down the tent at all the tie-down points; three on each side, three in the back, and two in the front, which excludes the two on each flap of the door. In total there are 15 tie-down points that can be staked down. 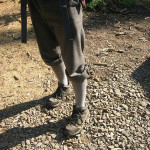 I prefer to use a stake with a hook at the end, as the tie-down point cannot pop off the end of the stake in high winds. With a bit of ingenuity and rigging you can set up the door to close from inside the tent, but in a rain storm I place my pack (with the rain cover on) in front of the door and wrap the two door flaps around the pack to seal out the elements. This method works quite well in a pinch – when the weather improves or when you have time you can rig the flaps to close from the inside (remember, this shelter has no zipper). Just make sure you bring a healthy amount of extra tent cord. This shelter has no bug netting nor a floor so if you tend to roll around in your sleep you should consider a ground tarp so you do not get your bag wet. Also, if bugs make you squeamish or if the mosquitoes will be bad you may want to bring your other tent with a floor and mesh. One morning after sleeping in the Quick Tent I woke up with a nasty bug bite on my face and one on my leg from an ant that had crawled in while I slept. 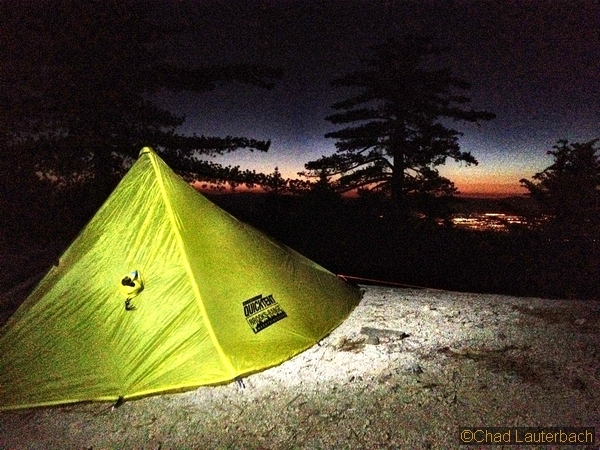 For me it was not a big deal as my other option was to carry my seven pound three-person tent. 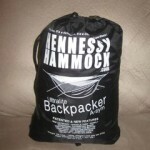 The weight savings and ability to carry a smaller pack more than makes up for the occasional run in with a bug. I found that pitching the tent with two poles (the one in the front set to 45” and the other fully collapsed at around 18” at the end) made it quieter in higher winds and kept the shelter material from resting on my bag. Condensation in this tent can be a problem, however. In one particularly bad storm I had to lay the tent down on the wet ground to set it up. Coupled with having to keep the doors closed for several hours while the tempest raged outside, the condensation built up quickly from the already damp interior coupled with my breathing and the moisture evaporating from the ground. However, after the storm passed, I opened the doors and within an hour everything was toasty and dry once again. At nights, if the weather was not bad, I slept with one door open to let in the fresh air and so I could see the stars. The shelter packs down incredibly small, is featherweight, and functions very well protecting from the elements while not weighing one down with lots of bells and whistles. The simplicity is a breath of fresh air, literally and figuratively. 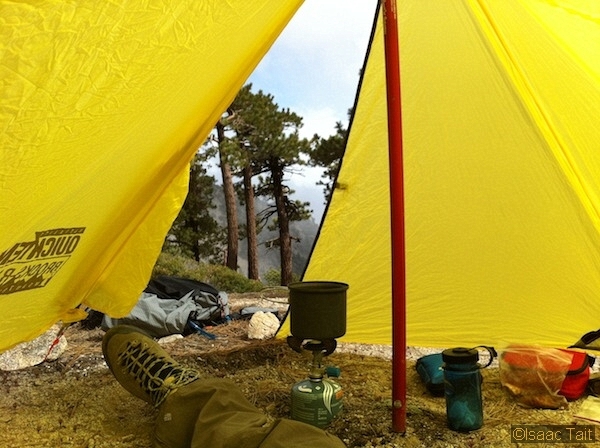 For me, it is the perfect shelter option to bring along on my day hikes and, after spending nearly a week sleeping in it, I have come to trust it as much as my other tents that weigh almost seven times as much. Even considering the drawbacks, I still enjoy sleeping in this tent, especially after years of carrying heavy, bulky, and cumbersome tents and fumbling with poles and zippers. This has actually become my favorite piece of gear, and that is saying a lot.